Here in the H.C. Andersen Garden one has a view of St. Knuds Church (cathedral), St. Knuds Monastery, and the small monastery garden. All bear the name of Knud the Holy, who was the King of Denmark in the years 1080-86. King Knud was unpopular, especially because of his tax policies and his call for aggression against England. On the run from rebels, Knud and his followers sought shelter in the defunct St. Albani Church. According to the monk Ælnoth's account, a spear flew through the window and killed the king as he prayed in front of the altar. His brothers, Oluf Hunger and Erik Ejegod, had him canonized and called on the English Benedictine monks to cultivate St. Knud's memory. In the crypt beneath St. Knud's Church one can see the sanctuary with Knud's earthly remains. The monks of St. Knuds were learned and enterprising people who brought knowledge about brick production and milling. They built the monastery by the river, standing next to the church and the Monks' Mill. During the Middle Ages, the monastery was extended and gardens were added. The little monastery garden, however, was first built in the 1920s. It contains 125 medicinal plants, many of which were introduced by the monks in the Middle Ages, including, amongst others, Red Butterbur, also known as Thundercrack or Pestilence, which was used against pests and wounds. It now grows everywhere along the river in large colonies, and perhaps one may recognize it from many of H.C. Andersen's tales. Her i H.C. Andersenhaven har du udsigt til både Skt. Knuds Kirke (domkirken), Skt. Knuds Kloster og den lille Klosterhave. Alle bærer de navn efter Knud den Hellige. der var konge af Danmark i år 1080-86. Kong Knud var upopulær, især på grund af hans skatteudskrivninger og hans indkaldelse til et krigerisk felttog mod England. På flugt fra oprorere sogte Knud og hans lensmænd ly i den hedengangne Skt. Albani Kirke. I folge munken Ælnoths beretning floj et spyd ind ad vinduet og dræbte kongen, mens han bad foran alteret. Hans brodre, Oluf Hunger og Erik Ejegod, fik ham ophojet til helgen og hidkaldte engelske benedektinermunke for at dyrke Skt. Knuds minde. I krypten under Skt. Knuds Kirke kan man se helgenskrinet med Knuds jordiske rester. 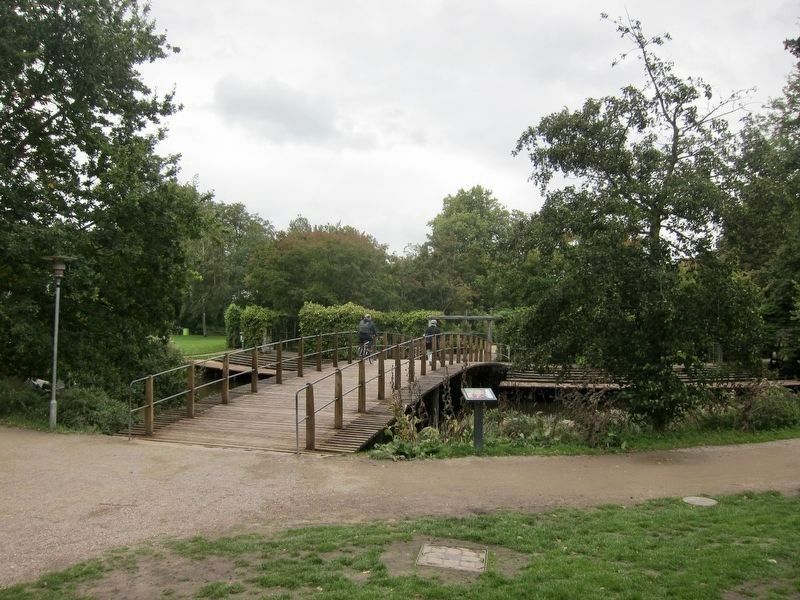 The marker is visible here just to the right of the bridge, while the pergola mentioned on the marker is visible in the background on the other side of the bridge. også kaldet Tordenskræppe eller Pestilensurt, der blev brugt mod mod pestbylder og sår. Den vokser nu overalt langs åen i store kolonier. og måske genkender du den fra mange af H.C. Andersens eventyr. H.C. Andersenhaven var indtil 1942 Fyns Stifts Læse-forenings rekreationssted - kun for medlemmer. Odense Kommune overtog stedet og satte havearki-tekterne C. Th. Sorensen og P. Wad til at indrette haven som den ser ud i dag. Centralt finder du den halvcirkelformede pergola med blomsterbede og grusstier. En smuk blanding af bynær natur og kultur-haver. Nyd blomsterduftene på en af de mange bænke, og scan QR-koden for at læse mere om kongemord og munke. Here in the H.C. Andersen Garden one has a view of St. Knuds Church (cathedral), St. Knuds Monastery, and the small monastery garden. All bear the name of Knud the Holy, who was the King of Denmark in the years 1080-86. King Knud was unpopular, especially because of his tax policies and his call for aggression against England. On the run from rebels, Knud and his followers sought shelter in the defunct St. Albani Church. According to the monk Ælnoth's account, a spear flew through the window and killed the king as he prayed in front of the altar. His brothers, Oluf Hunger and Erik Ejegod, had him canonized and called on the English Benedictine monks to cultivate St. 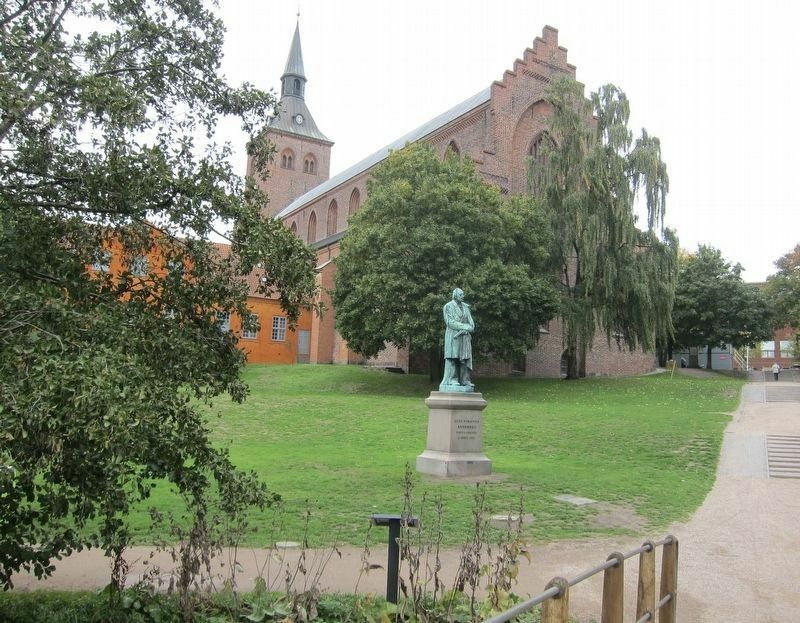 The view from directly behind the marker (visible in the foreground) shows a statue of Hans Christian Andersen, with St. Knuds Church behind him, as well as the monastery (the orange-ish building abutting the church). Knud's memory. In the crypt beneath St. Knud's Church one can see the sanctuary with Knud's earthly remains. Until 1942, the H.C. Andersen Garden was the Fyns Foundation Reading Society's recreational site - for members only. The municipality of Odense took it over and had the pieces of art by Carl Th. Sorensen and P. Wad installed to decorate the garden as it looks today. In the middle one may enjoy the semi-circular pergola with flower beds and gravel paths - a beautiful blend of nature and cultural gardens. Enjoy the flower fragrances on one of the many benches and scan the QR code to read more about regicide and monks. Location. 55° 23.702′ N, 10° 23.398′ E. Marker is in Odense, Syddanmark, in Odense Kommune. Touch for map. Marker is in this post office area: Odense, Syddanmark 5000, Denmark. Touch for directions. Other nearby markers. At least 8 other markers are within walking distance of this marker. Grønbenet Gakket Gangart / Washladies, Water Sprites, and Waddlers (about 210 meters away, measured in a direct line); Munke Mølle / Monks' Mill (about 240 meters away); Hans Christian Andersen - School (about 240 meters away); The Oldest Kingdom of the World (approx. 0.3 kilometers away); Ambrosius Stub (approx. 0.3 kilometers away); Nonner på Vikingborgen / Nuns at the Viking Fortress (approx. 0.3 kilometers away); Ølbryggeri Og Gelændergaranti / A Beer Brewery and the Guaranteed Railings (approx. 0.3 kilometers away); Hans Christian Andersen at Vestergade 57-59 (approx. 0.4 kilometers away). Touch for a list and map of all markers in Odense. More about this marker. The marker is located in Eventyrpark (H.C. Andersen Garden), roughly in the center of the park, on the north side of the bridge that leads to a small island in the middle of the river. More. 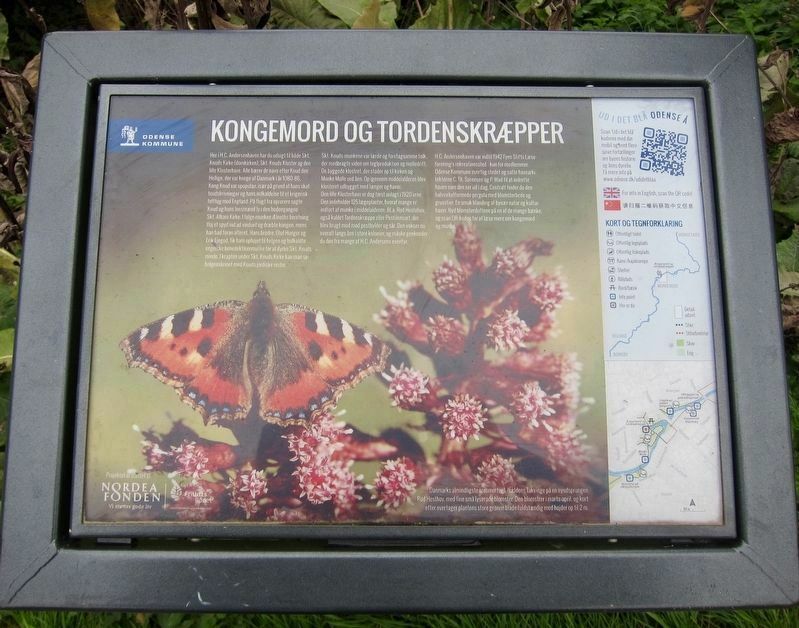 Search the internet for Kongemord og Tordenskræpper / Royal Murder and Red Butterbur. Credits. This page was last revised on February 26, 2019. This page originally submitted on February 26, 2019, by Andrew Ruppenstein of Sacramento, California. This page has been viewed 34 times since then. Photos: 1, 2, 3. submitted on February 26, 2019, by Andrew Ruppenstein of Sacramento, California.